At some point in the future, when authoritative histories of twentieth century art begin to be written with the wise judgment that only distance from the present time can confer, I believe that Stan Brakhage will loom not only as one of the very greatest of filmmakers but as one of the major figures in all the arts. The sheer virtuosity of his work, the sensual beauty of his films' shapes and colors and textures, his creation of a unique and complex kind of visual music (most of his films are silent because the music comes from the screen), his appeal to the viewer as individual rather than as a member of a crowd, the ecstatic unpredictability of his spaces and rhythms, all assure the monumental importance of his close to 400 films, both individually and as a body of work. This best known and most influential of all "experimental" or "avant-garde" filmmakers took light as his great subject, and his interest in light itself was tied to his interest in recovering that which he acknowledged no adult could ever recover, the pre-linguistic seeing of children ("How many colors are there in a field of grass to the crawling baby unaware of 'Green'?" he famously asked), an interest which transmuted itself into a desire to free objects and light from structures based on language. Brakhage's films vibrate between a series of opposing poles that are never quite as opposite as they seem at first. Chief among them is the two senses that light and objects have in his films. We see things for their recognizable and namable forms — that is a pregnant woman in Window Water Baby Moving — and also, even in this most documentary of Brakhage films, as a play of light and shape, for example his poetic stress on the way light is refracted through water droplets on the woman's belly. Part of Brakhage's goal is to enrich viewers' seeing of things in the ordinary world, to help each viewer uncover unique and imaginative ways of seeing. Brakhage made many films by painting directly onto the film strip, sometimes producing suggestions of shapes or spaces: The Lion and the Zebra Make God's Raw Jewels and Chartres Series are both stunningly effective evocations of their subjects, even though they contain no "pictures." In others, such as the Arabics, Brakhage creates shifting, out-of-focus abstract forms that seem to elude namability completely. And in the found footage used in Murder Psalm, Brakhage explores the negation of his aesthetic as found in mass culture: light seems imprisoned in objects that reduce active living and thinking to static things — the brain is seen as a shape that's visually rhymed with a ball that children used to torment each other. A narrative film creates an arc of expectation that sets up conflicts and tensions the viewer expects to have resolved — or at least, lead to some form of conclusion. Brakhage's films are organized according to a precisely opposite principle. There is no overarching or predictable form; his emphasis is on each instant of perception. One way he achieves this emphasis is by organizing his films around unpredictable changes in composition, subject-matter, and rhythm: each small pattern that a film sets up is violated just at the moment when you think you have finally apprehended it. 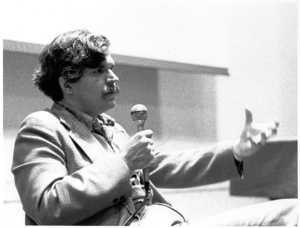 The process of viewing a Brakhage film becomes part of the film's subject; in answer to the passivity encouraged by a mainstream commercial narrative movie, Brakhage requests active participation. Relaxing one's perceptions when the lights dim, as many movie viewers are accustomed to doing, won't work here: one must learn to see faster, more precisely, and more deeply. Brakhage's work offers an eloquent and deeply affecting alternative to consumer culture in the West. He abjures predigested emotions, predictable formulas, and "pretty pictures." His films cannot be reduced to a simple summary or message, and each viewer's experience of them will necessarily be somewhat different. The engaged viewer is removed from the state of mind in which to look at a scene or sight is to desire it, covet it, think you understand it, and wish to own it: instead, Brakhage asks for both much less and much more — he asks that you dance with it.